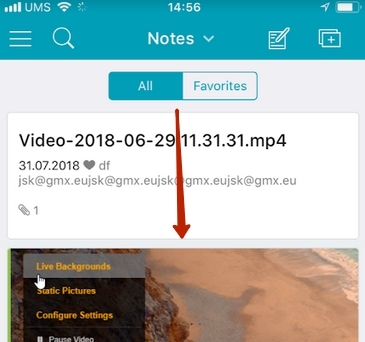 How do I create photo or audio/video note? 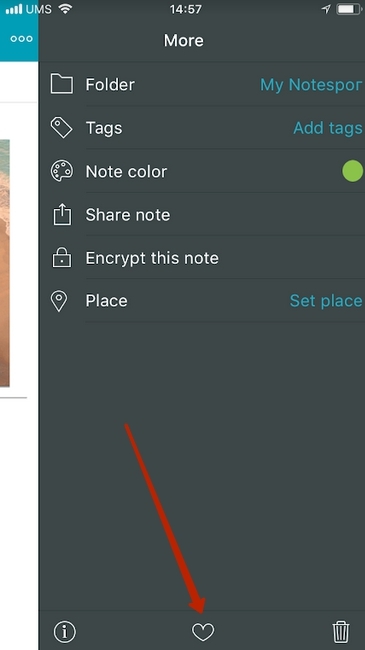 How do i encrypt my note? How do I begin editing a note? How to rename a folder or a tag? How to create a public link for a folder? 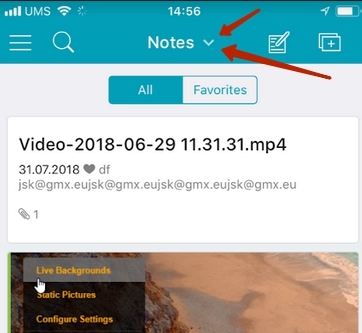 How to change the note list view? How to change note sorting? 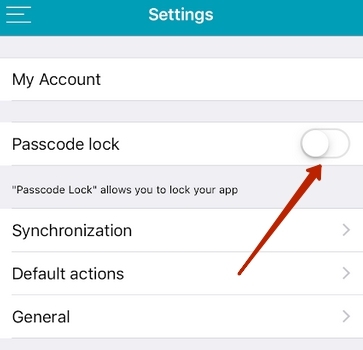 How do I set a lock-password for the application? How do I synchronize notes? How to select multiple notes for editing? How to add notes to Favourites? How do I get rid of the Favourites folder and prevent notes from getting added to it with a swipe? How do I edit or delete a task in To-Do? Can I change a note position in To-Do based on its priority? Can I create a separate To-Do note? Can I hide completed tasks? 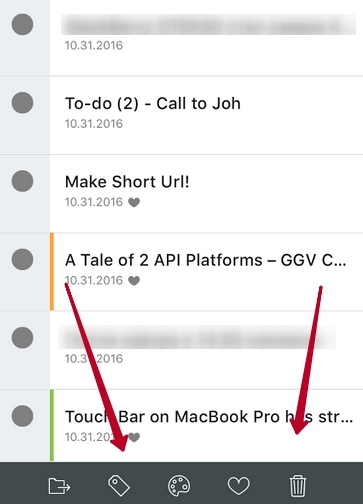 Can I add tasks to the To-Do List from the editor? How do I change a note folder? How do I change note tags? How do I get a link to a note? How do I change a note's geolocation? How to create a note associated with a location? What does "Days left in cycle" in account settings refer to? How to create a note for a specific map location? How do I find a list of all locations I put on the map? How to scan business cards? How to scan a document with Nimbus Note? You need to have a Nimbus account for full-featured use with a mobile device. 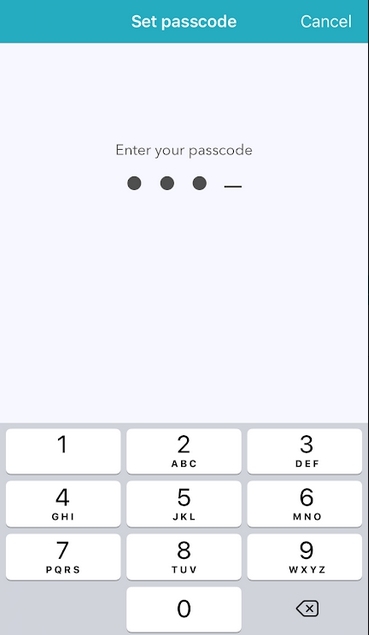 If you already have an account, you can enter your e-mail and password in the form and press Sign In. Otherwise, you need to create an account (this will not take longer than 30 seconds). You should open the desired folder, tap on the + button and then choose photo, audio, video or to-do note. Nothing could be easier! 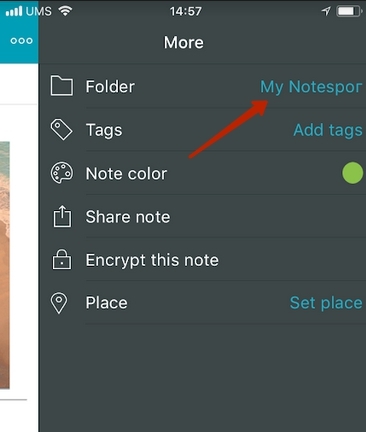 Nimbus Note offers combined note viewing and editing, so you only need to tap on a text fragment to begin editing. Swipe on the name of the desired folder. In the menu that appears press +Subfolder and enter the subfolder name in the form. Yes, you can assign a color for every folder. 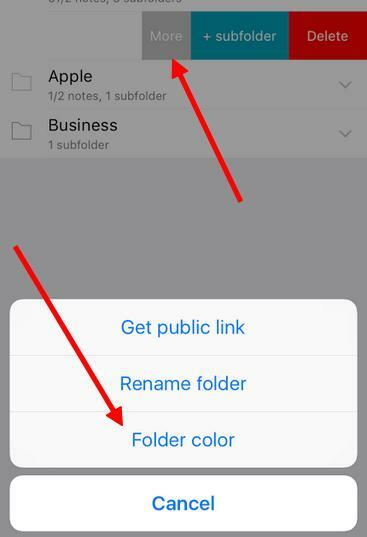 For that, make a swipe on the folder and select More, then click on Folder color and select a color you want for the folder. Make a swipe on the required folder or tag and select Rename. Make a swipe on the name of the required folder and press More. In the menu that appears select Get Public Link. 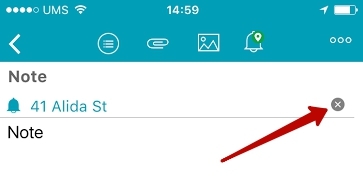 Press on the arrow above the note list. Cards - displays the list as a grid of large images with text. Change NOTE LIST VIEW - you can refine appearance settings here, for example, choose to display just note titles without description. 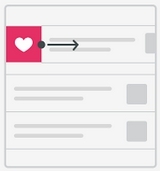 Press on the arrow above the note list. 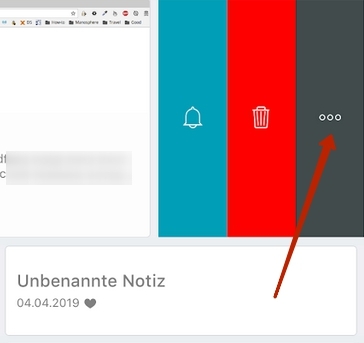 In the menu that appears, you can choose from different note sorting options on the list: sort them by date of creation or modification, by reminders etc. a) On the list of notes or folders, drag the top corner down to launch synchronization. b) In the left menu select Sync. When you use Fast Sync, only note titles and descriptions are downloaded and the text and any attachments will not download automatically. 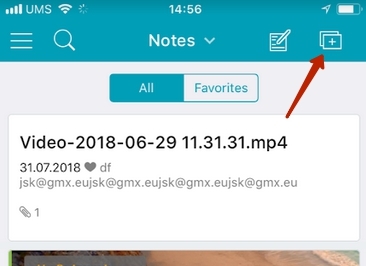 The text and attachments will only download when you open a specific note. 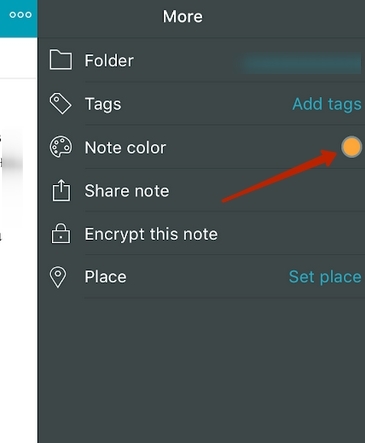 If you use Full Sync, texts and attachments for all the notes will download. This type of sync can take a long time, and you may need a larger volume of Internet traffic. Make a long tap on the required note and then select the rest. 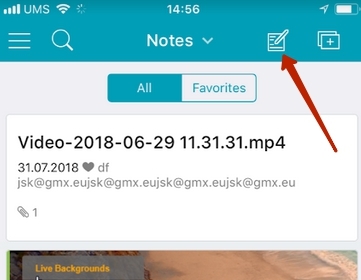 Then you can choose the type of action for editing multiple notes: move to a different folder, change tags, assign a color tag, add to Favourites or delete. a) Swiping left to right on a note on the note list will add it to Favourites. Doing the same again will remove it from favourites. b) Pressing on the heart in the note menu. Pressing on the icon again will remove the note from Favourites. c) Through editing multiple notes (you can select multiple notes using long tap and add them all to Favourites). You can change Favourites settings in Settings - General. Open To-Do List and press the + button. Double-tap on the task you want to edit or delete. Now you can edit the task; if you would like to delete it, just clear the form and the task will disappear. Sure! You can move the tasks around by using the drag & drop mechanism. You surely can! 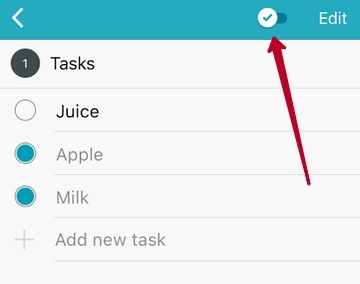 You just need to press the To-Do button, after which you will be able to add the tasks and save the note. Yes, you just need to switch on the option Don't show completed tasks. Yes, you can. Just press the to-do button and add the tasks in the window that opens. Open the note and tap on the sidebar button. Then, click on the current folder. In the window that opens, select the desired folder or create a new one. Open the note and tap on the sidebar button. Then, press Tags. In the window that opens, select the desired tags or create new ones. Make a swipe on the required tag and select Delete. Open the note and tap on the sidebar button. Then, press Get public link. Open the note and tap on the sidebar. Then, press Set place. Open Places. 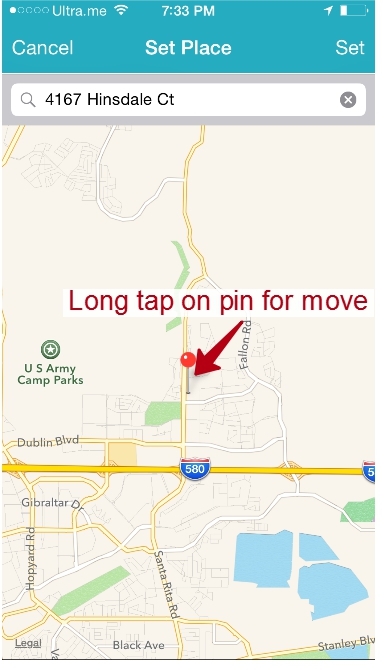 Find a location on the map and make a long tap on it. In the window that appears press Ok.
During synchronization, all data (notes) is sent to the Nimbus Note server. Over the period of a single cycle (30 days) you can send up to 100 megabytes of new data. Every 30 days, a new cycle begins, and the traffic counter is reset so you can send a new total of 100 megabytes. However, even if you reached your traffic limit before the cycle has run out, your app remains fully functional, and you can continue working with your notes. The only feature that won’t be active is the ability to send notes to the server, but this is only until a new cycle begins. Select Time Reminder. 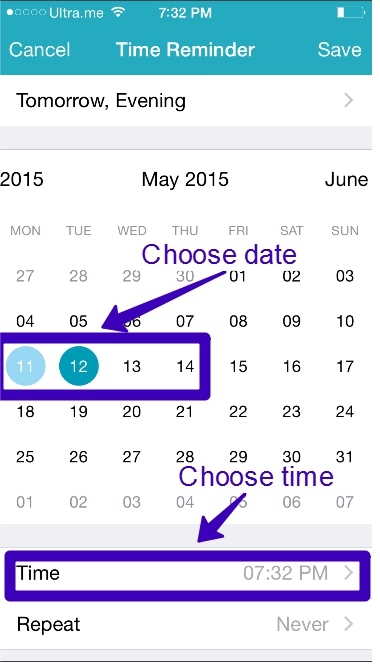 Using the calendar and the clock, set the desired date and time. If you need the reminder to repeat after a certain period, click on Repeat and select the period. To save the reminder, click on the checkmark. Open the note. Click on Reminder. Select Location Reminder and then choose the desired location on the map and press and hold down the location on the screen. The blue pin should move there. To save the reminder, tap on Set. Find the location and make a long tap on it. Open Places and click on the icon in the top right corner. In the window that appears you will see all previously added map locations. 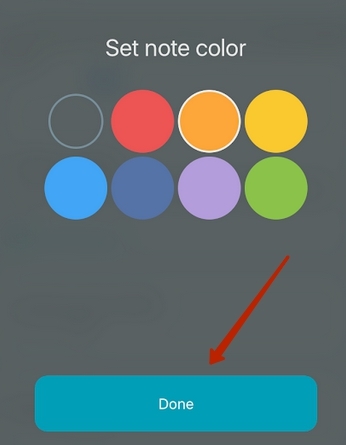 1) Make a swipe on the note title on the note list. Tap on the More icon and select a Note color. I want for the folder list or specific folder to open when the app is launched. Open settings and go to Default Actions. Press Folders and select All Folders or a specific folder. You can also add a list of tags that could open when the app is launched. You can absolutely do that! Open settings and go to Default Actions. Press on Right Swipe and select the required action. Find Nimbus Note on the list of widgets and press on the plus.